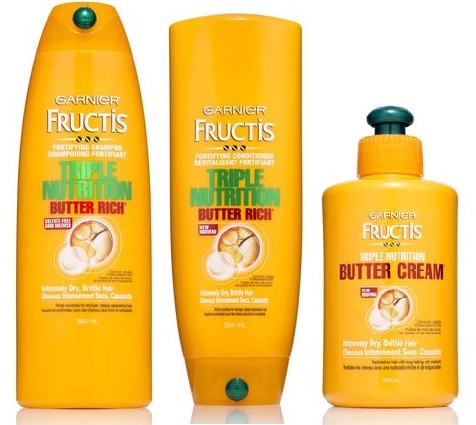 Garnier Fructis Triple Nutrition Butter Rich joins the fight against dry hair! Intensely dry, brittle hair is going to love itself some Garnier Fructis Triple Nutrition Butter Rich - enriched with coconut, jojoba and macadamia oils - selected for their high-performance nutritive power - and natural glycerin to treat the driest hair by supplying it with the extra nourishment it needs, the formula surrounds the fiber with a portective barrier to cat and help to stabilize constituents in the hair, for longer-lasting nutrition and strength, 3 times the moisture and 3 days of frizz-resistance with softness and no greasy effect.. Triple Nutrition Butter Rich Fortifying Shampoo & Conditioner - 384ml - $5.29 - with a sulfate-free formula to cleanse gently without stripping hair's natural moisture that deeply moisturizes and nourishes for hair that is stronger. Triple Nutrition Butter Cream - 300ml - $6.79 - a rich, quenching leave-in that replenishes for long-lasting moisture to leave hair stronger, softer and shinier. Not only will it leave hair looking and feeling better, it will also smell better with a colourful, fruit-infused fragrance with top notes of watermelon, peach and citrus; heart notes of fresh water, light florals and botanical greens; and a base of coconut, musk and heliotrope. Smashbox Be Legendary Lipsticks - with swatches! Annabelle Big Show Lacquer - with swatches! Essie Resort 2016 Collection - with swatches!